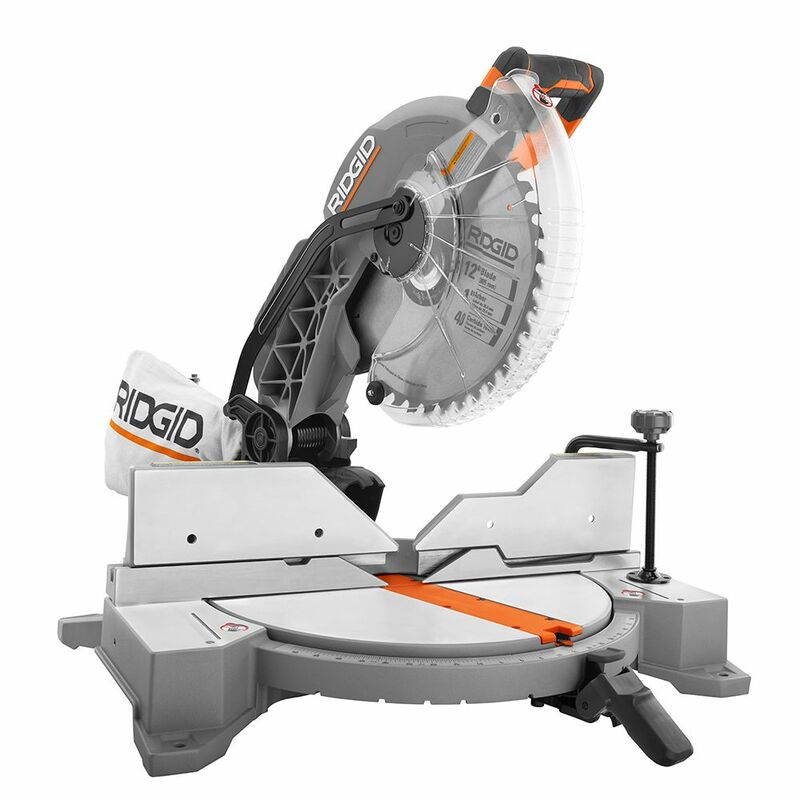 RIDGID introduces the 15 Amp Corded 12-Inch Dual Bevel Mitre Saw with LED Cutline indicator, Carbide Tipped Blade, and Dust Bag. Its dual bevel capability and adjustable mitre table make it perfect for a wide range of cuts and applications. A powerful motor paired with best-in-class features provides ultimate convenience on any job site. With registration, this tool is backed by the Industry's Only Lifetime Service Agreement: FREE Parts. FREE Service. For LIFE. The 15 Amp 12-Inch Dual Bevel Miter Saw includes a 12-Inch carbide tipped blade and blade wrench, two sliding miter fences, a dust bag, a work clamp, and an operator's manual. Bosch's Axial-Glide system on the Dual-Bevel Glide Miter Saw eliminates three key challenges saw users have endured since the first slide systems debuted many years ago. While the traditional sliding compound miter saw approach enables users to make wider cross cuts, that system takes up more space and is prone to misalignment and stickiness over time. By replacing the sliding rail system with a hinged or articulating glide arm system - similar to the linkage used in a four-bar suspension design - Bosch created a more compact miter saw that delivers durable precision, remaining true and smooth over time! The 6950-20 12" Dual-Bevel Compound Miter Saw offers best in class accuracy, power and ease of use. The Miter Angle Digital Readout provides repeatable accuracy to 0.1. The Miter Angle Fine Adjust with Detent Override makes it simple to dial-in precise miter angles. Dual Integral Jobsite Lights fully illuminate the work piece and cut line from either side of the blade. The powerful 15.0 AMP, 3.3 Max HP Direct Drive Motor provides increased power for high performance cutting in hard lumber. Constant Power Technology with Soft Start maintains constant cutting speed under load and decreases start up head movement. The Integral Dust channel captures up to 75% of the dust and debris cut. The Milwaukee 12 inch Dual-Bevel Sliding Compound Miter Saw offers best in class accuracy, power and ease of use. Miter Angle Digital Readout provides repeatable accuracy to 0.1. The Miter Angle Fine Adjust with Detent Override makes it simple to dial-in precise miter angles. Dual Integral Jobsite Lights fully illuminate the work piece and cut line from either side of the blade. The powerful 15.0 Amp, 3.3 Max HP Direct Drive Motor provides increased power for high performance cutting in hard lumber. Constant Power Technology with Soft Start maintains constant cutting speed under load and decreases start up head movement. The Integral Dust channel captures up to 75% of the dust and debris cut. 15 Amp Corded 12-Inch Dual Bevel Mitre Saw RIDGID introduces the 15 Amp Corded 12-Inch Dual Bevel Mitre Saw with LED Cutline indicator, Carbide Tipped Blade, and Dust Bag. Its dual bevel capability and adjustable mitre table make it perfect for a wide range of cuts and applications. A powerful motor paired with best-in-class features provides ultimate convenience on any job site. With registration, this tool is backed by the Industry's Only Lifetime Service Agreement: FREE Parts. FREE Service. For LIFE. The 15 Amp 12-Inch Dual Bevel Miter Saw includes a 12-Inch carbide tipped blade and blade wrench, two sliding miter fences, a dust bag, a work clamp, and an operator's manual.